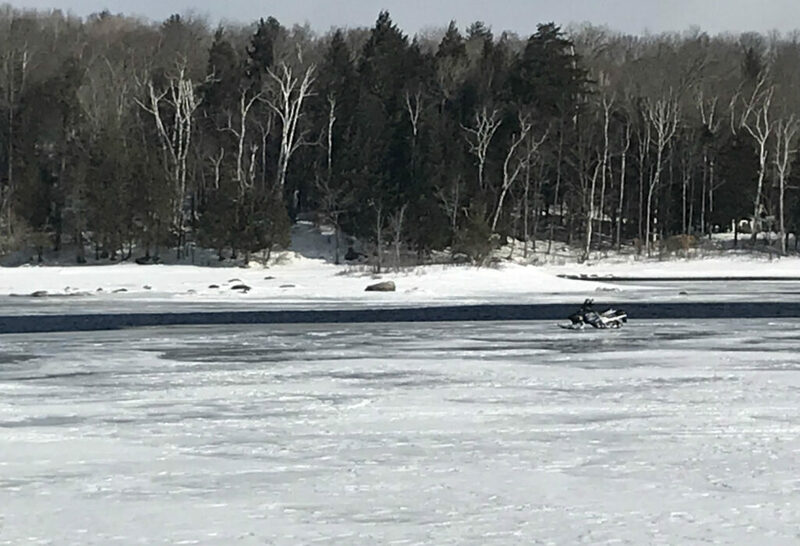 A party of snowmobilers was rescued after two of their members plunged into Sebec Lake in Piscataquis County early Saturday. One of the men was treated for hypothermia at a Dover-Foxcroft hospital after the incident. The Maine Warden Service said Timothy Carignan, 30, and Nicholas Smith, 31, both of Berwick; Nathan Lynch, 32, of North Berwick; and James Taylor, 39, of Dover, New Hampshire, were snowmobiling shortly after midnight when they encountered thin ice on Sebec Lake. Lynch and Taylor plunged into the lake along with their snowmobiles. Both men managed to get out of the water and Taylor drove off in one of the two remaining snowmobiles to an unoccupied camp to find warmth. The three remaining men, who were stranded on thin ice near portions of open water, called for help. The Sebec Fire Department, Mayo Ambulance and Game Warden Jeremy Kemp responded about 1:20 a.m. Kemp borrowed a canoe from a camp owner and ventured out onto the ice with Sebec Firefighter Jason Horne. The two men managed to get the three stranded snowmobilers into the canoe, which became overloaded. Carignan got out of the canoe and partially broke through the ice, holding onto the side as rescuers pulled it across the ice to safety. The three snowmobilers were brought to a nearby camp to warm up. Kemp then searched for Taylor. He was found in an unheated camp at 2:20 a.m., showing signs of hypothermia and unable to walk. Kemp and several other emergency workers carried Taylor through 2 feet of snow to the closest plowed driveway. Taylor was taken to Mayo Regional Hospital in Dover-Foxcroft and treated for hypothermia. Game wardens said Taylor would have died if he had not been found. The two snowmobiles remain at the bottom of the lake in 12 feet of water. The incident is under investigation. Game wardens returned to the scene later Saturday morning.